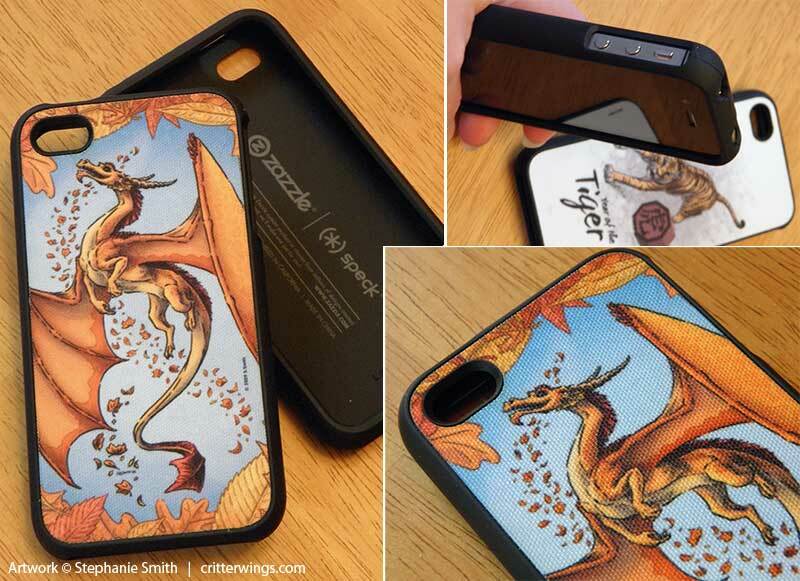 Zazzle has been steadily adding new products to their lineup, and I’ve finally gotten a chance to add some of them to the Critterwings store. It’s hard to find the info about them on their website, so I ordered a few to see for myself and I wanted to share the pictures with you. Because all of the cases look amazing! I only ordered iPhone 4 cases, because that’s the phone I own, but they are also offering iPhone 3/3G, Blackberry Curve and Bold, and Samsung Galaxy cases in the Case-Mate style. Hopefully I can get this posted in time for folks to take advantage of the amazing coupon sale at Zazzle: 50% off of shirts, cards, calendars, necklaces, ornaments, phone cases, and more, through 4pm PST on Friday, November 18 with coupon code FFHSHUGEDEAL If you miss out, the coupon is still good for 20% off for the rest of the weekend. And remember, everything at Zazzle can be customized, or you can make your own from scratch, and still get the same discount. Originally, Zazzle only offered the Speck Fitted fabric-backed case, seen here. This is a hard-bodied clamshell case with rubberized edges and a fabric cover on the back, which is printed. It’s a very solid case, with good access to the buttons and feels like it can take a blow. There’s also a nice bezel around the screen to protect it from damage. The rubber edges make it the most comfortable style to hold, and it snaps very tightly together. I had to search YouTube to figure out how to open the Speck case back up again to change it. The buttons are easy to get to, and I was even able to use it with my docking stations without removing the case — without the docking adaptors in place, anyway. The colors printed nice and bright on the fabric, although not as brightly as the other cases, but because of the grain of the material my ink drawings lose a lot of sharpness and detail. I’m a little concerned about keeping the fabric clean, but so far the trimmed edges seem nicely sealed down and unlikely to fray any time soon. I bought this a little while ago, and at the time it shipped by itself in a small zipper bag with no other packaging, which might be a concern if you’re getting it as a gift for someone else. Recently, Zazzle started also offering Case-Mate brand phone cases, for many different kinds of phones. There are a few different styles available for iPhones: “Tough” and “Barely There” Both have a lightweight plastic body with a glossy finish that reproduces the colors gorgeously. The printing is crisp and bright and wraps around the sides. They ship in a display box with a screen-protector kit. Although in my case the boxes were not factory-sealed and had gotten a bit squashed in shipping, they are still nice if you’re buying them as a gift. 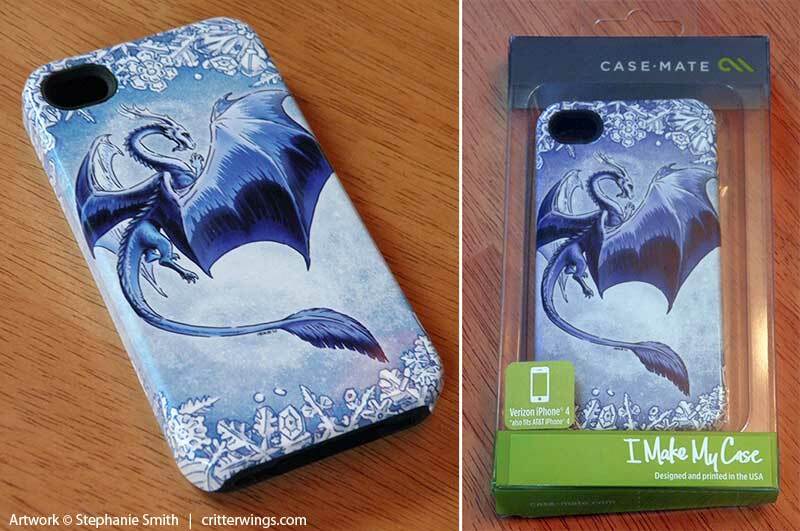 Above is “Dragon of Winter” on the Case-Mate Tough case. This case includes a soft rubbery liner that protects most of the buttons and also provides a bezel to protect the screen. It seems very solid once it’s in place, and has a pretty good feel in the hand, but I find the plastic surface harder to hold on to. (Personally, I find the iPhone 4 by itself hard to hold onto, and I’ve been relying on my cases to keep it from leaping out of grasp like a live fish…) The buttons were easy to use through the rubber coating. I just got these cases in yesterday so I have yet to see how they hold up to scratches and scuffs. The last case I have to share today is the Case-Mate Barely There ID case. This clever case includes a slot that can store 2 credit/ID cards, but is otherwise identical to the other Barely There case Zazzle sells. These cases have the same printing as the Tough case above, but are much more form-fitting to the phone so they’re very compact and take up hardly any extra bulk. As you can see, the plastic is very thin, and does not include a bezel around the screen. All the ports are very open and while the bump of the card slot may cause some docking issues, I can’t imagine any docking station having a problem with the non-ID version of this case. If like me you have trouble holding onto your iPhone 4 this case won’t help you at all and it doesn’t seem to provide as much impact protection as the other models. However, despite appearances the case snaps on very tightly (I haven’t figured out the knack for removing it yet) and it ships with a screen-protector kit. 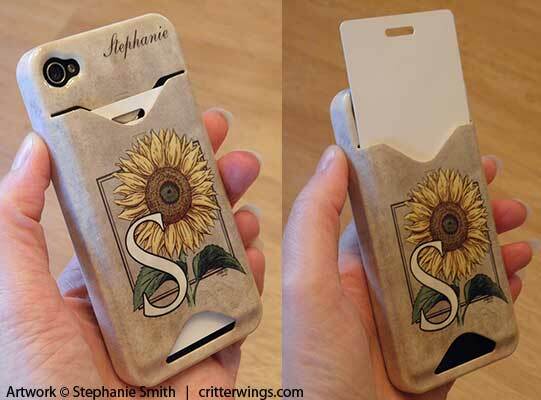 If you’re just looking for something decorative it’s a nice economical option for a custom-printed case. I hope this is helpful. 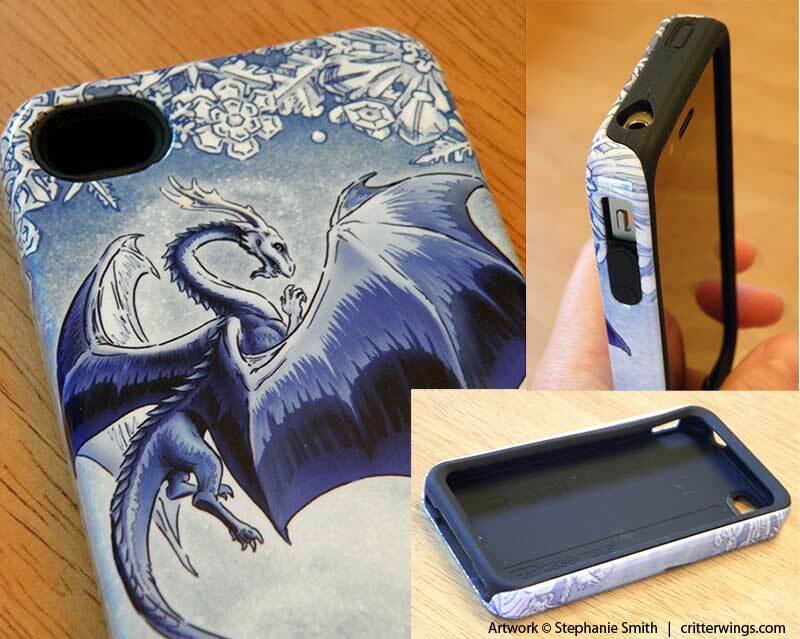 I have most of my designs on most of the models of cases Zazzle offers — iPhone, iPod Touch, Samsung, and Blackberry — but I’m still working through the backlog. Let me know if there’s something missing that you want! 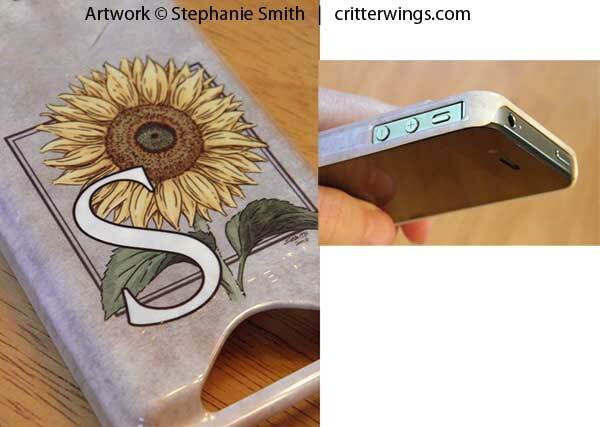 This entry was posted in Critterwings, sale by stephanie. Bookmark the permalink. I have a speck hard candy case and it does a great job protecting my phone. Do you happen to know how the casemate tough compares? I’ve been thinking about getting one. I never had that particular speck case, so I can’t do a direct comparison, but I’ve been using the Casemate Tough for over a week and I’m liking it so far… feels really solid, and I like that the screen bezel is rubbery, because if I’m putting the phone down on a hard surface I can put it down face first and it won’t slide.